L'Atelier Alain Ellouz guesting by David Morris! L’Atelier Alain Ellouz guesting by David Morris! 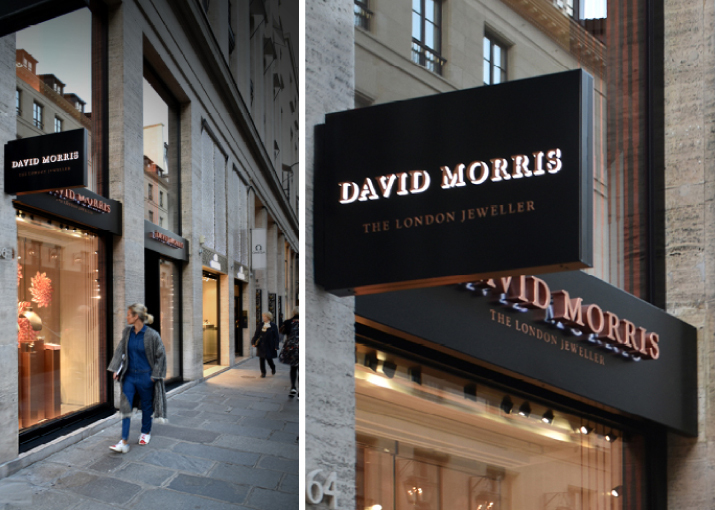 In march of 2017, David Morris, the celebrated English jeweler, opened his new jewellery house on rue Saint Honoré, in Paris. The design in its entirety, was conceived and orchestrated by the artist and architect Eugène Brunelle, and as such, we are proud to have been included as a part of this wonderful design event. 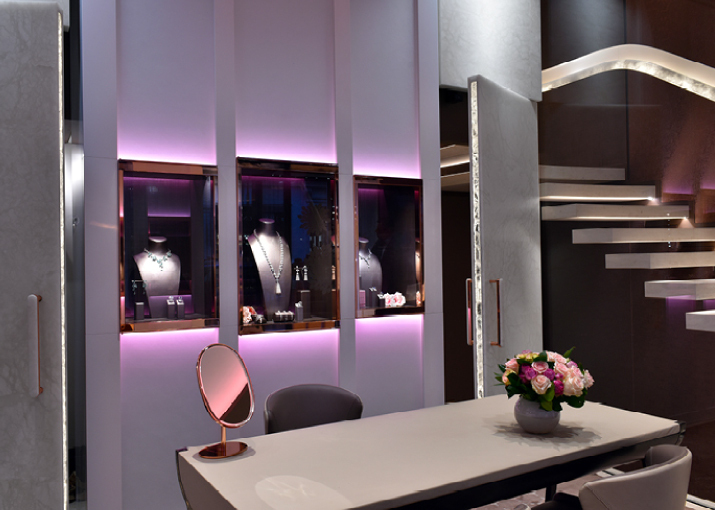 Conceived and achieved, as a veritable showcase, the two-storey jewellery house is full of many details that Eugène Brunelle has not left to chance. He came to us, to create the two gallant doors that stand on either side of the ground floor principal display cases, and also, for the stairway handrail leading high to the VIP area within. With the doors, the challenge for us, was to marry our two favorite stones, alabaster and crystal rock, and then to integrate them into the doors that would be both heavy, but that would open witheasewhenpullingupontheir rose-gold and alabaster handles. Our challenge was well met. By imagining these two large doors covered with our finest alabaster, and adorning them along their edges with illuminated crystal rock, Eugène Brunelle draws wonderful attention to the precious stone that is not apparent at first glance. It is only when the doors gently open, that the illuminated crystal rock appears, as would diamonds or a hidden treasure. This surprise union was also achieved so as to preserve the mysterious opacity of the alabaster and the light it allows passage, to illuminate the crystal rock, and to play with the subtle contrasts of the jewellery. All the quintessence of the jewellersworkmagnified in this opening door. Climbing the height of the stairs, you will discover a new and more intimate space. 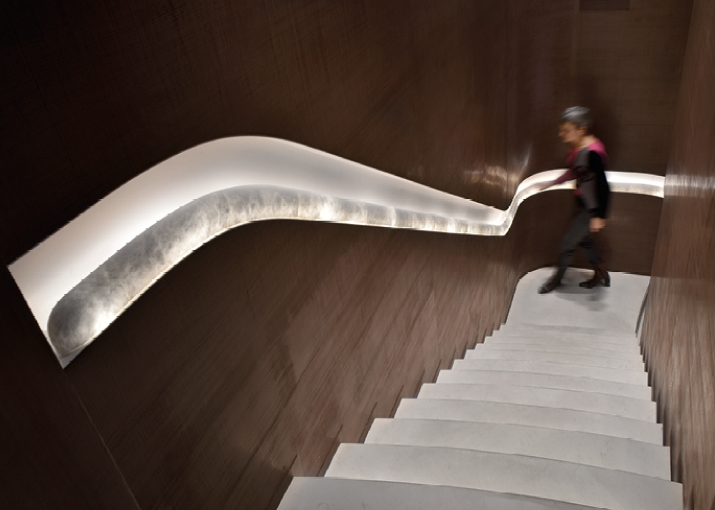 To lead you there, an alabaster handrail, softly backlit, and with sensual curves, that Eugène Brunelle has designed to be both contemporary, and a “continuous line”, guides your way higher, above the floating stairs. Eugène Brunelle succeeded in marrying the elegance of the alabaster with the glamorous, precious nature of crystal rock, to adorn this enlightened space that he had intended to be “opened as much as is possible”. An exceptional and delicate alliance of inspiration that we most strongly recommend you discover.